Sofiah studied at the Folkestone School of Art, and Walthamstow College, where Celia Birtwell was her textile tutor. 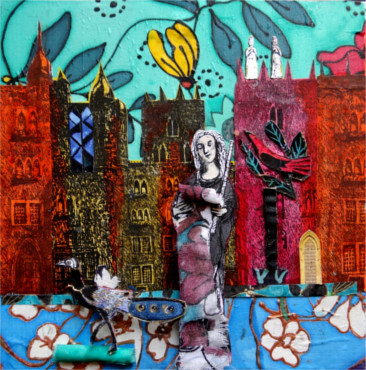 She has continued to broaden her experience as painter and etcher, extending it during her arts degree at Canterbury Christ Church University and now bringing everything together in her collages. Sofiah has shown her work in a wide range of venues including Canterbury (the Cathedral Chapter House), Folkestone, Norwich, the Printmakers Council London, Horsebridge Gallery, Puebla (Mexico) and elsewhere. In May 2017 her work was featured in the "Be Magnificent. Walthamstow School of Art 1957-1967" exhibition at the William Morris Gallery, London. Green Chair Gallery has published two books of Sofiah's work illustrated with poems by Emmanuel Williams which have both proved innovative and popular. Sofiah's work is in private collections across the UK, USA, Australia and Europe. My work is ever changing and just when I feel comfortable it shifts. I find my subjects emerging from both real life and "other worlds" in equal measure, with the resulting images being added to by my own "inside story": what I cannot see but what just might be there or which could be messages to be decoded by the viewer. My regular starting point is my own drawings, paintings or textiles that set the background images to which I then add 3-D figures, items, characteristics or whatever comes forth. Nothing is pre-determined, although when the work itself takes shape its form is clearly delineated. But I am often left wondering just what will come next. And THAT is exciting.